Laundry. It’s a never ending cycle and I always feel money is going down the drain. Sorry, I couldn’t help myself. It was just too punny. I’d buy organic laundry soap so the clothes are clean and the grey water is safe too. Then I realized if I bought bulk supplies I could make my own cleanser and save on fossil fuels and packaging waste. And then….I met Crystal Wash and realized…I could save even more. Enter Crystal Wash. Crystal Wash sent me the orbs and all I had to do was give an honest review after I washed our clothes with them. Oh momma. Let me tell you! First off…Crystal Wash is 2 grey death star looking orbs with wee bio-ceramic beads inside that are running around like storm troopers pre-dark side, alkylating the water to remove the stink, dirt, sweat and stains in our clothes. Ha! There are even white & black beads! Sorry… Star Wars on the brain so I had to make this…..
Anyhoo…unlike the Death Star these 2 balls actually work at destroying the stinky, dirty mess that is our laundry. We have chickens, ducks, rabbits, dogs, goats, mud, blood, feed and fodder we deal with daily. That’s five types of poop alone! Then there’s blood ‘cause someone is always getting cut and oil from Ben’s work clothes. So, it was surprising to me when they actually worked on heavily soiled clothes. I honestly didn’t think they stood a chance! But they REALLY worked! I’ve been using them hard for a few months now and the only “issue” is that you need to set them out in the sun for a good 24 hours and let the sun “reactivate” aka ”kill off the funk from our clothes”. IF you don’t do that…heaven help you as you get out of the shower and stick your face right into a now slightly damp towel. There is NOTHING worse than getting out of the shower, grabbing a fresh towel out of the drawer…and discovering…NOPE…it’s NOT. That discovery is what really made me realize how awesome Crystal Wash works. A gag and scream for a sheet while pulling towels out of the drawer to be tossed back into wash is all that is required after setting the outside in the sun to fix that problem! 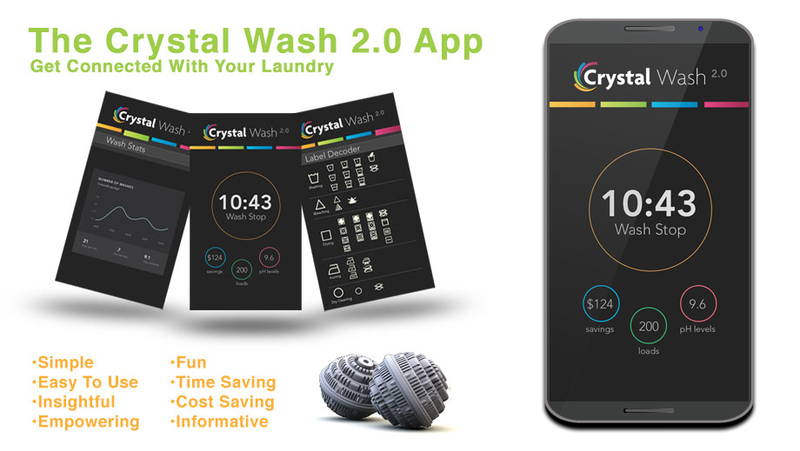 There’s also an app that’s coming later this year with Crystal Wash 2.0 that will help you with recharging. It’ll send a notification that it’s time! The new version has a microchip which monitors the beads. Hello!!! No more gagging on a wet towel cause you forgot to recharge it. I adore Crystal Wash. If you’re not doing 2 loads of laundry a day, and/or you’re not getting clothes as dirty as we do I bet you could go 2-3 weeks between recharging them in the sun. Crystal Wash is great for the environment as you’re not using fossil fuels to bring you soap, You’re not spending time or effort buying previously made of even the ingredients to diy it. It’s always at home so all you need to worry about is did you air it out? It’s easy peasy. It washes at least 1000 loads of laundry for only $50-60 bucks. 1,000 loads of laundry is around $300. It works on cleaning very well, but it didn’t remove all our stains. Of course, neither did other cleaning products unless I added a bit to the item of clothing and scrubbed it. So, if you have a stain on an important piece of clothing…treat it first. 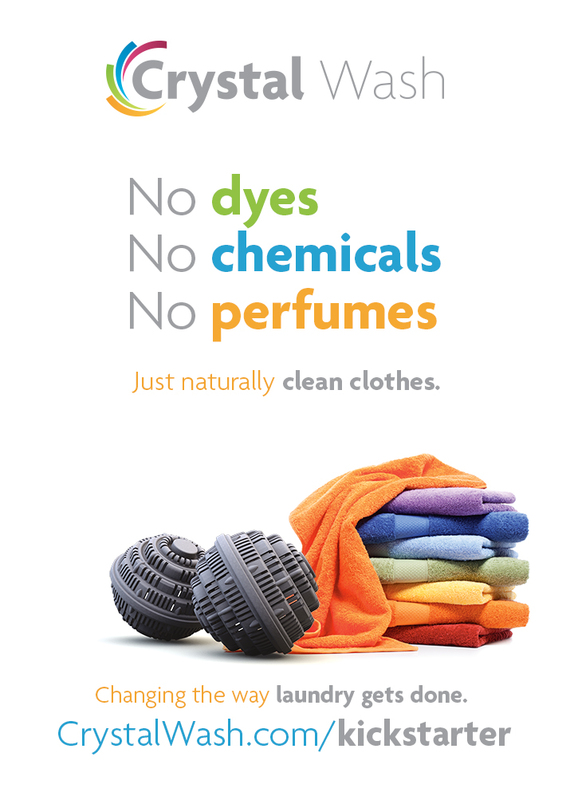 I’m all about simplifying laundry while saving money, time and the environment. And, I think Crystal Wash makes that happen. You can find Crystal Wash on Amazon too! « Deer Creek State Park; the DO Park. Hi, so can you confirm that they are safe to use with a grey water system? I’d like to make sure it’s not going to change the soil it drains into. i currently use a gray water safe soap, but no soap would be ideal. I can’t give you any studies or such but I can tell you how we used ours. We also had a grey water system. We pumped our shower and laundry water out into the yard where we set up a perforated collection tank that allowed water to filter down through the yard. We never had any issue with grass or bugs or the animals getting sick or wanting to drink the water any more than normal. Once we got goats they were too nosy not to investigate teh sound of the sump pump pumping the water out into the tank. They figured out how to open the tank and after they broke it we stopped putting it back on. THat was our fault as we weren’t willing to give up the free mowing the goats offered to offset the aggravation of keeping the tank covered. It was on a hill so it drained pretty quick. The grass wasn’t taller nor shorter with the crystal wash compared to our grey water safe soap. Now I would recommend you do keep your grey water soap because they do have to be recharged and you’ll need to wash while recharging if you’re like us. They need more time to charge during winter. THere is NOTHING worse than forgetting and sticking your face in a stinking towel fresh out of the shower. It is FOUL. Think wet dog, mixed with funk and dry heave. It’s lovely. Keep a hidden stack of clean towels for everyone as your ER set because trust me…get back in the shower and wash again. Holler for someone to get that hidden set for you. If you don’t reshower…you’ll smell that nasty all day and get whiffs through the day. Believe me.